I have to admit it – when i was first given the opportunity to read an advance copy of Unravelled by Canadian author, M.K. Tod, I was a bit wary. I love reading, I love historical fiction – but reading about war? Not so much. I anticipated perhaps having to drag myself through the book without actually enjoying it. I was SO wrong. By the end of the first chapter, I was hooked. I mean, really, really hooked. I started reading it on a long plane trip and every time they made me turn off my electronic devices I was counting down the minutes until I could dive back into this book once again. Written in anticipation of the 100th anniversary of World War I, this novel takes you on a journey through the lives and marriage of Edward Jamieson and his wife Ann. I appreciate MK Tod’s writing for giving us insight into both characters’ thoughts and emotions. We see aspects of their lives from each of their perspectives as well as the impact living through two world wars has had on them. My knowledge of these world wars was previously limited to history books I had read on the topic but this novel takes those facts and with historical accuracy, weaves them into a compelling story that provides the human side of these events. Tod writes a riveting story with characters whose love and passion, sense of duty and honour, sacrifice and guilt, draw you into their lives and enable you to see their world through their eyes. In October 1935, Edward’s memories of WWI and his passionate affair with Helene Noisette reemerge when he receives an invitation to the Vimy war memorial dedication. Attendance at the ceremony results in Edward being forced into reliving his wartime experiences, seeing and feeling the barbarity of war at every turn and resulting in a chance encounter with Helene, events that send both Edward and Ann into a tailspin of emotions. When war breaks out again several years later, Edward and Ann are quickly drawn back into it as he is recruited to train espionage agents while she is counseling grieving women who have lost their sons and husbands. Secrets and lies once again threaten their relationship as they try desperately to hold on in the midst of the heartbreak and devastation of war. If you can’t already tell, I give this book a big ol’ 5! I’m already planning to read it again and I’m casting the movie in my head. NOW for the really fun parts – first of all, if you want to see just why I’m raving about this book, you can check out Chapters One and Two of UNRAVELLED for yourself! AND if YOU would like a chance to win your very own copy of the ebook version of Unravelled, here’s your chance! A book launch event for UNRAVELLED will be held on October 8, 2013 starting at 7 p.m. at the Duke of York at 39 Prince Arthur Avenue in Toronto, Canada. M.K. Tod writes historical fiction and blogs about all aspects of the genre at A Writer of History. Her debut novel, UNRAVELLED: Two wars. Two affairs. One marriage. is available in paperback and e-book formats from Amazon (US, Canada and elsewhere), Nook, Kobo, Google Play and iTunes. 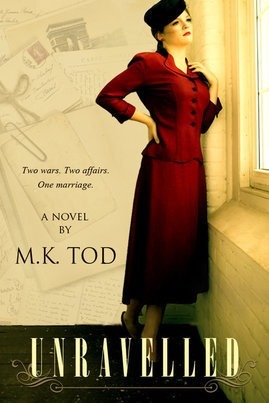 Mary can be contacted on Twitter: @MKTodAuthor, Facebook, and GoodReads. I hope you get a chance to read it, Kathleen. And if you do, I’d love to hear what you think! Most like to read Gothic Literature, YA, supernaturals. Anything with vampires, werewolves, shape-shifters, witches, superpowers. Then it’s fiction, autobiography, memoirs. My favourite types of books are Chick Lit. Stories about women’s lives, but not mysteries, thrillers, dystopia type books. Emily Giffin is an author whose books I enjoy. I hope you give Unravelled a try, Bonnie. Love to hear what you think! I like to read books about my field: human rights and mysteries, historical novels, and travel memoirs.